You’ll have an easy weeknight dinner option with this coconut crusted Mahi Mahi with creamy lemon sauce. Mahi Mahi recipes are some of my favoriet – they’re gluten-free and bakes in under 15 minutes. 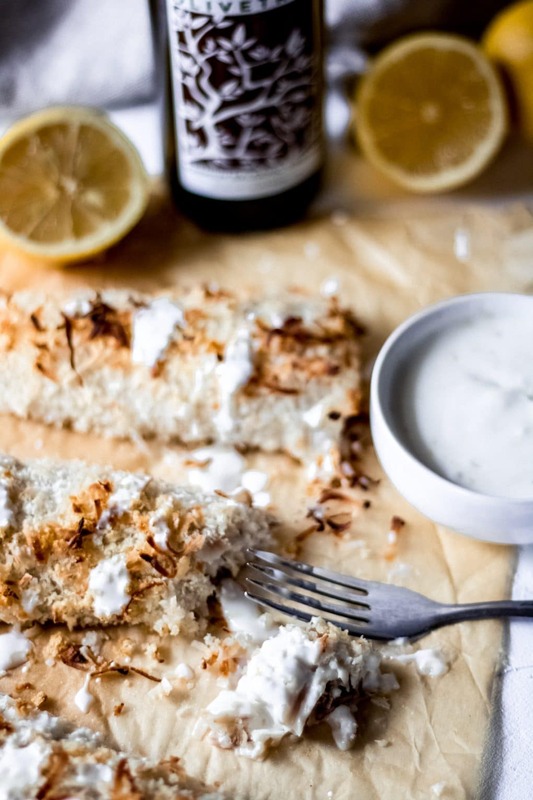 The coconut crusted Mahi Mahi has a mild flavor that naturally pairs with the creamy lemon sauce, even the pickiest of kids might even give this a try! This sponsored post is in partnership with Olive Tree. All thoughts and opinions expressed herein are my own and not influenced by the company and its affiliates in any way. This post may contain affiliate links. Please see my affiliate disclaimer. What is the flavor of Mahi Mahi? If you like a mild white fish, then Mahi Mahi is definitely for you. Mahi Mahi has a lean flesh with large, moist flakes. 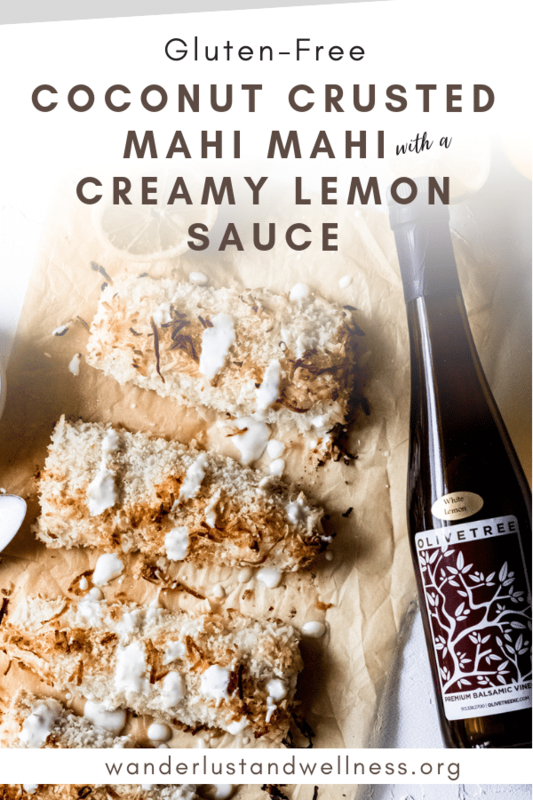 Its flavor is very mild with a hint of sweet, which is why pairing it with coconut and lemon is perfect. I would compare Mahi Mahi to that of Swordfish, Cod, or Tilapia. As with any fish, how you prepare it can also affect the flavor profile. 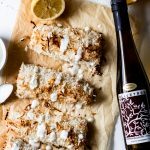 In this recipe, I wanted to bring forth the coconut and lemon flavor, so you’ll first coat the Mahi Mahi in coconut oil and Olive Tree’s White Lemon Balsamic Vinegar before then coating with a mixture of gluten-free panko bread crumbs and sweetened shredded coconut. This helps mask any strong fish flavoring that one might notice if they’re more sensitive to those types of flavors. 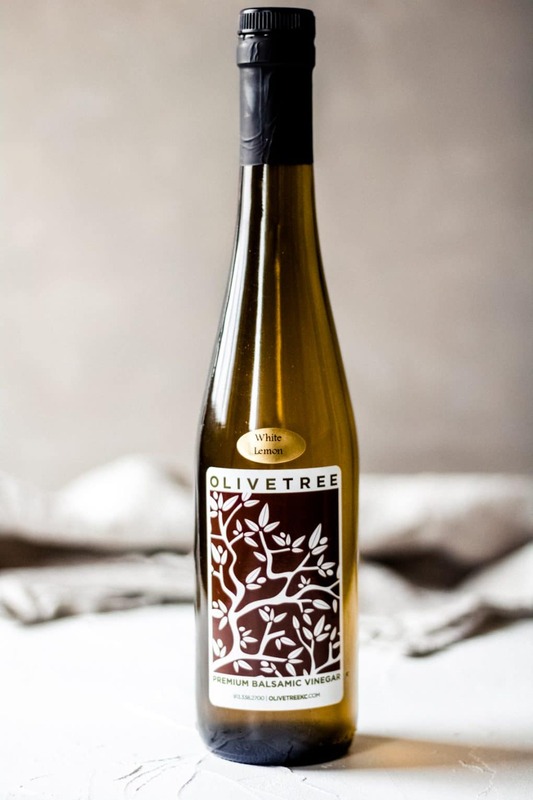 Our partners at Olive Tree produce some of the finest olive oil and balsamic vinegar blends. For this recipe, we’re featuring their White Lemon Balsamic Vinegar, which pairs perfectly with both the fish and helps create the creamy lemon sauce. Unlike other balsamic vinegar you may have tried, Olive Tree’s are high quality and bring forth a beautiful flavor profile. This White Lemon Balsamic Vinegar is thick and has just enough sweetness to compliment the normal tartness of vinegar. To make this dish gluten-free, the recipe calls for gluten-free panko bread crumbs. If gluten is not an issue, feel free to use regular panko bread crumbs. For a dairy-free option, replace the greek yogurt with full-fat canned coconut milk – 3/4 cup total for the sauce. The recipe calls for sweetened shredded coconut, but if lower sugar content is needed, feel free to swap in unsweetened shredded coconut. You’ll have an easy weeknight dinner option with this coconut crusted Mahi Mahi with creamy lemon sauce. It’s gluten-free and bakes in under 15 minutes. Line a baking sheet with parchment paper, then spray parchment paper with nonstick cooking oil. In a bowl, combine the gluten-free panko bread crumbs and shredded coconut. Lay the fish fillets out onto another sheet of parchment or wax paper. In a small bowl, combine the melted coconut oil and White Lemon Balsamic Vinegar. Stir to combine. Using a pastry brush, brush the oil and vinegar combo onto both sides of the fish. Then, coat both sides of the fish with the panko bread crumbs and shredded coconut mixture. Use your hands to pat down the coating and ensure the fish is fully covered. Place the coconut crusted Mahi Mahi fillets onto the oiled parchment paper. Bake for 10-12 minutes, or until the fish easily flakes. While the fish is cooking, combine the creamy lemon sauce in a medium-sized mixing bowl and stir to combine. Set aside until ready to serve. Remove the fish from the oven and serve with the creamy lemon sauce. Enjoy these other coconut and Mahi Mahi recipes!